Why dogs need interactive toys! exercise, dogs may grow bored and engage in destructive behavior. Environmentally friendly TPR material, which is resistant to biting and does not harm dog teeth, helps relieve pain during tooth replacement. Promote proper chewing behavior and prevent bad behavior. 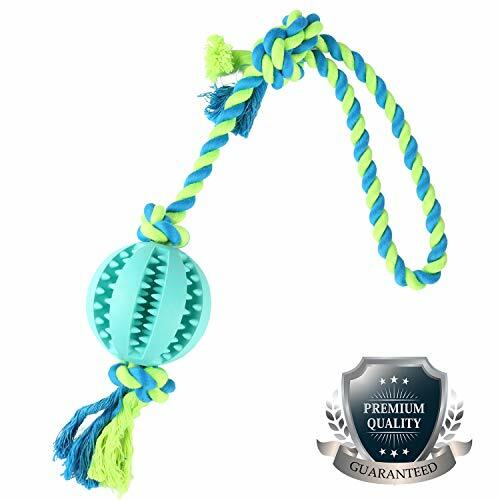 [ High Quality ] - Dog rope toy cotton rope ball made of natural rubber, safe and non-toxic,for your pet, A puppy chew toys are made to be washable and easy-to-use. [ Teeth Cleaning ] - The rope chew toy during chewing promote clean teeth and help control plaque and tartar buildup, reducing plaque build-up and preventing gum disease. [ Plenty of uses ] - Train the dog to engage in a "stretching" interactive game with the owner to establish a tacit understanding between the dog and the owner.decreases separation anxiety, promotes proper chewing behavior and deters misbehavior. [Purchase Guarantee ] - If you find any question let our high efficiency, friendly and responsive after-sales team know and we'll solve it in time. If you have any questions about this product by KAOSITONG, contact us by completing and submitting the form below. If you are looking for a specif part number, please include it with your message.